Role and ideal technique of bacteriological culture in acute open fractures. Department of Orthopaedics, St. John’s Medical College, Bengaluru, Karnataka, India. 1287, 21 B Main, 11th Cross, Sector -1, HSR Layout, Bangalore – 560 102, Karnataka. India. Introduction: The role of perioperative cultures to identify infection in open fractures has been doubtful. The method of sampling for cultures in open fractures includes swab or tissue collection. However, the efficacy of either of these two techniques has not been compared in the setting of an acute open fracture. We conducted a study to compare the bacteriological culture results between the two techniques. Methodology: A pilot study was done at our institution, where all type 2, 3A, and 3B open fractures admitted in the emergency and operated for debridement and stabilization were included in the study. Intraoperatively, after debridement of the wound, swab and tissue specimens were collected and sent to the same laboratory. The results of the cultures were then collected for comparison after the necessary incubation period. Follow-up of outpatient records was also done to see its clinical significance. Results: A total of 30 samples of swab and tissue cultures collected post-debridement of acute open fractures in the operation theater were studied. Only 13 samples grew an organism either in swab/tissue culture or both. Nine tissue samples and eight swab samples showed growth. In four cases, both swab and tissue showed growth, but the same organism grew in only one instance. The other three cases showing growth in both tissue and swab had different organisms. Statistically, the kappa coefficient was found to be 0.26 and the agreement between swab and tissue culture was found fair. However, the kappa did not account for the species of the organisms. Tissue samples showed more number of specific organism growing in them, compared to swab culture samples. Conclusion: The ideal technique of taking samples for culture in acute open fractures is uncertain. Tissue culture may be better in isolating specific organisms in an acute open fracture wound. However, it is uncertain if the same organism may cause infection. Keywords: Open fractures, swab culture, tissue culture, infection. Infection poses a serious problem in the management and outcome of open fractures . The role of perioperative cultures to identify infection in open fractures has been doubtful [2, 3]. The method of sampling for cultures includes swab or tissue collection . Studies have previously compared swab cultures at different stages – pre-debridement and post-debridement [3, 4, 5, 6, 7, 8]. Post-debridement cultures have been found to be more reliable compared to pre-debridement cultures in identifying the infecting organism and resulting infection [4, 5, 8, 9]. The efficacy of either of these two techniques when done at the post-debridement stage of an acute open fracture has probably not been studied so far. We conducted a pilot study to compare the bacteriological culture results between the two techniques – swab and tissue culture in acute open fracture wounds. This study aims to compare the bacteriological results using swab and tissue in acute open fractures. This is a prospective study done at our institution between April 2017 and April 2018. Before the beginning of the study, the institutional ethical clearance was obtained to conduct a pilot study to compare between swab and tissue cultures in acute open fracture wounds. Following the results of which a larger size sample was to be studied, after the initial sample size of 30. The inclusion criteria were all type 2, 3A, and 3B open fractures admitted in the emergency and operated for debridement and stabilization. Patients with type 1 and type 3C fractures were excluded in the study. Early wound wash and splinting were done in emergency followed by anti-tetanus prophylaxis and administration of injectable cephalosporin, aminoglycoside, and metronidazole. The patients were then taken for emergency debridement of the wound and definitive or temporary stabilization, as planned preoperatively. Intraoperatively, after debridement of the wound, swab and tissue specimens were collected and sent to the same laboratory. The swab was collected using Levine’s technique, and for tissue sample, a piece of muscle from the central deep part of the wound was taken. The time taken to reach hospital following fracture, time taken to begin operative debridement, and time taken for sample collection were noted. The results of the cultures were then collected for comparison after the necessary incubation period. The outpatient records of the study group were then reviewed for information on wound status, infection, and subsequent culture growth if any. A total of 30 open fractures were included in the study (Table 1). There were 28 patients, with two patients presenting with two open fracture wounds at different sites at the same time. The most common mechanism of injury was road traffic accident (63.3%) followed by workplace injury (26.7%) and fall (10%). Type 2 open fractures were the majority in the study (63.3%) followed by type 3A (20%) and 3B (16.7%). 30 samples of swab and tissue cultures collected post-debridement in the operation theater were studied. Only 13 samples grew an organism either in swab/tissue culture or both (Table 2). Nine tissue samples and eight swab samples showed growth. In four cases, both swab and tissue showed growth, but the same organism grew in only one instance. The other three cases showing growth in both tissue and swab had different organisms. Of 23 patients showing no growth in swab reports, 18 did not have any growth according to tissue. 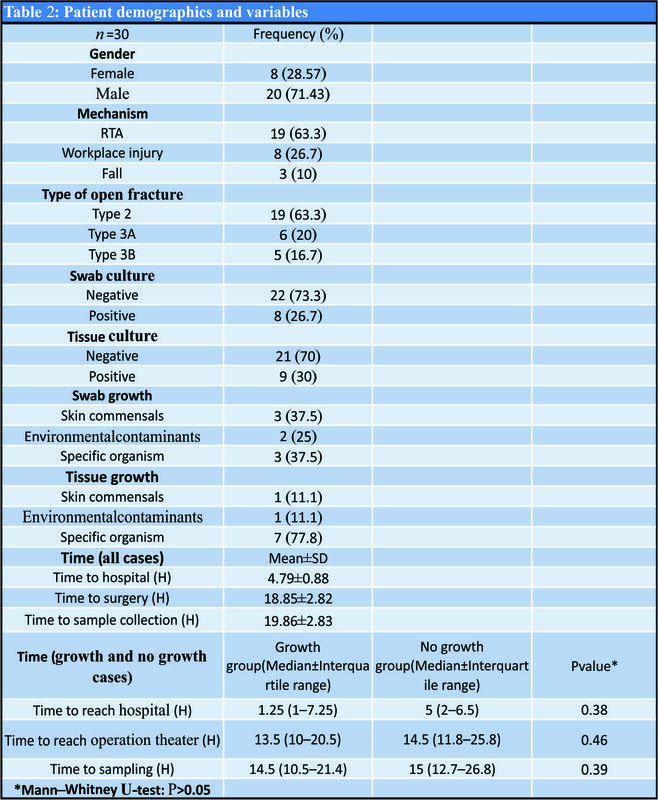 Statistically, based on if growth was seen or not in swab and tissue culture, the kappa coefficient was found to be 0.26 and the agreement between swab and tissue culture was found fair (Table 3). However, the kappa did not account for the species of the organisms, which were different in swab and tissue cultures. 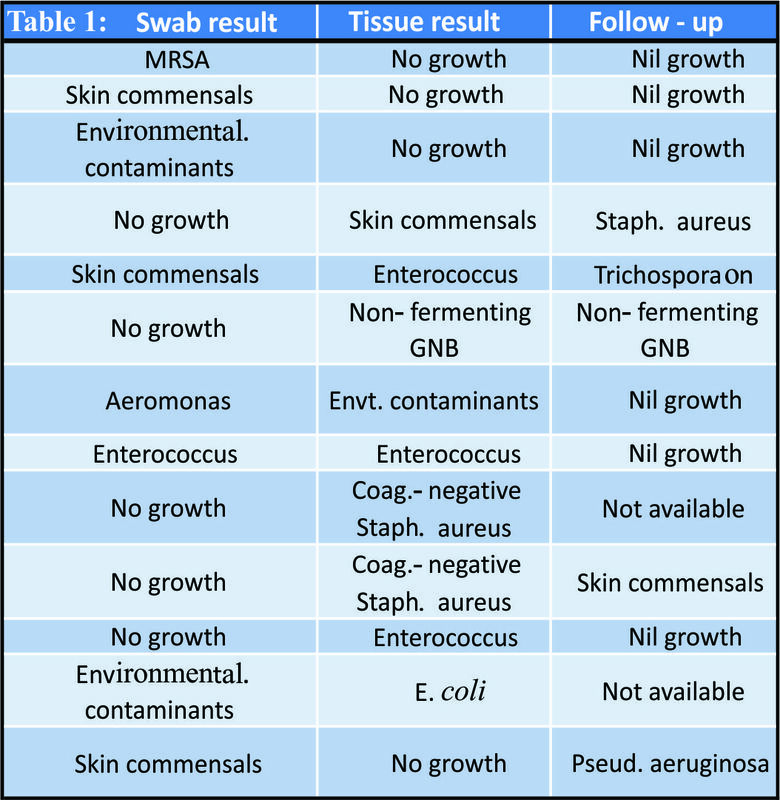 Both swab and tissue cultures showed skin commensals (Table 1). The number of environmental contaminants was two in the swab group and one in the tissue group (Table 1). A specific organism was seen in three cases of swab culture, while seven were seen in tissue culture cases. 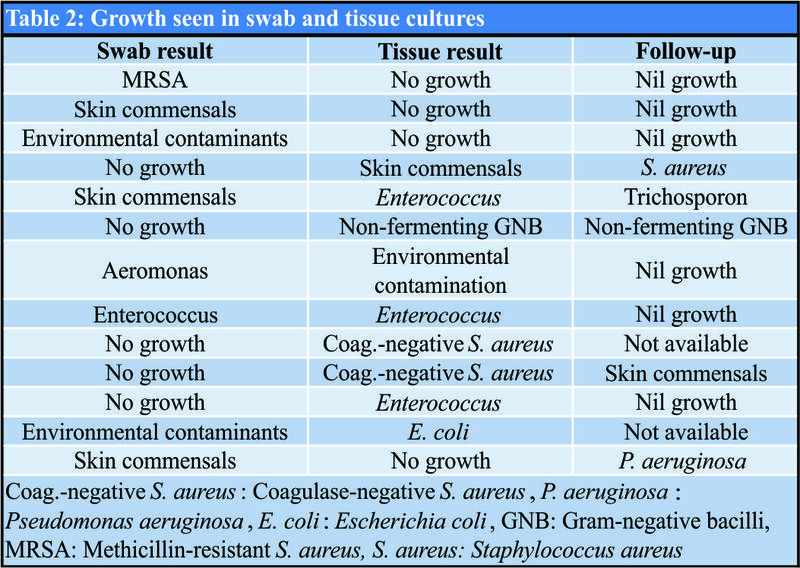 Tissue samples showed more number of specific organism growing in them, compared to swab culture samples, although it was not statistically significant (P= 0.15:Table 3). The time taken to reach hospital following fracture, time taken to begin operative debridement, and time taken for sample collection were noted, in both groups showing growth and no growth. There was no statistical difference between the two groups, probably due to the small sample size of our study Follow-up records of all the cases were seen to check if any signs of infection or discharge from wound site were detected subsequently. Of 13 cases that grew an organism in either swab or tissue or both, two patients were lost to follow-up. The remaining 10 patients who had initial growth in swab/tissue or both, follow-up in five of them had a growth of organism from the wound at a later date. Except for one patient who grew the same organism as before, the growth isolate in the rest of the patients was different from what was grown initially. Only one patient, who had no growth initially both in swab and tissue, showed growth from culture at wound site discharge, detected at 3-week follow-up. Isolation of bacterial growth in wounds is a commonly followed procedure. However, its efficacy and the ideal technique to isolate bacteria are not yet fully understood. Tissue biopsies are preferred in chronically infected diabetic wounds  and found even more reliable when associated with osteomyelitis . Studies have shown superiority of intraoperative tissue biopsy samples for bacterial culture in prosthetic joint infections  and infected pressure sores of spinal cord injury cases . In cases of implantable cardiac device infection, studies have shown patients with clinical infection, having positive cultures more frequently by pocket tissue culture than by swab culture . Sepsis in patients with burns was also found to be better correlated to quantitative burn tissue biopsy cultures than surface swab cultures . Our study shows that tissue culture technique may be better in identifying a specific organism. However, its clinical significance could not be established as the same organism is not seen to be mostly grown subsequently, if infection arises. Studies previously have compared pre-debridement swabs and post-debridement tissue cultures, where the latter have been more predictive about subsequent infection [3, 8]. The correlation of post-debridement cultures with subsequent infection rates has been attributed to the possibility of hospital-acquired infections playing a role [9, 16]. Therefore, in this setting, we collected swab and tissue culture samples post-debridement of the open fracture wound in the operation theater. Our results show fair agreement between swab and tissue cultures in terms of growth seen, but dissimilar organisms on most occasions. The follow-up in five cases which showed a growth eventually did not correlate with the initial growth in four cases. This is in agreement with other studies, where initial cultures in open extremity injuries were not the same organisms that eventually led to wound infections [4, 17]. This is our preliminary findings of the pilot study comparing swab and tissue cultures in acute open fractures. We are continuing the study, to include larger sample size and see the results of it. Limitations of the study include lack of longer follow-up and small sample size, as this represents results of the pilot study. The study further with a larger sample size and other variables such as mechanism of injury, longer follow-up, time taken to reach hospital, time taken to surgical debridement, and time taken for sample collection, should give an insight into the role of wound cultures and the best technique to employ between the two. The ideal technique of taking samples for culture in acute open fractures is still not yet established. Tissue culture may be better in isolating specific organisms in an acute open fracture wound. However, it is not certain whether the organisms isolated at the post-debridement stage will be the same organism to cause infection subsequently at the wound site. The ideal technique of obtaining wound cultures in acute open fractures is still not certain, while tissue cultures may be useful in identifying specific organisms. 1. Badia JM, Casey AL, Petrosillo N, Hudson PM, Mitchell SA, Crosby C, et al. Impact of surgical site infection on healthcare costs and patient outcomes: A systematic review in six European countries. J Hosp Infect 2017;96:1-5. 2. Brown CM, Heckmen JD. Rockwood and Green’s Fracture in Adults. 8th ed., Vol. 1. Ch. 10. Philadelphia, PA: Wolters Kluwer’s; 2015. p. 360. 3. Faisham WI, Nordin S, Aidura M. Bacteriological study and its role in the management of open tibial fracture. Med J Malaysia 2001;56:201-6. 4. Agarwal D, Maheshwari R, Agrawal A. To study the pattern of bacterial isolates in open fractures. J Orthop Traumatol Rehabil 2015;8:1-5. 5. 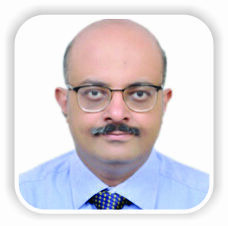 Gupta S, Saini N, Sharma R. A comparative study of efficacy of pre and post debridement cultures in open fractures. Internet J Orthop Surg 2012;19:3. 6. Lingaraj R, Santoshi JA, Devi S, Najimudeen S, Gnanadoss JJ, Kanagasabai R, et al. Predebridement wound culture in open fractures does not predict postoperative wound infection: A pilot study. J Nat Sci Biol Med 2015;6:S63-8. 7. 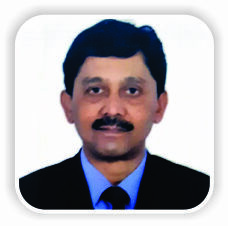 D’Souza A, Rajagopalan N, Amaravati RS. The use of qualitative cultures for detecting infection in open tibial fractures. J Orthop Surg (Hong Kong) 2008;16:175-8. 8. Mangala A, Arthi K, Deepa R. Comparison of predebridement and debridement cultures in predicting postoperative infections in compound fractures. J Clin Diagn Res 2018;12:DC06-9. 9. 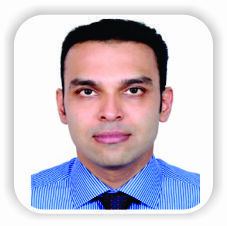 Lee J. Efficacy of cultures in the management of open fractures. Clin Orthop Relat Res 1997;339:71-5. 10. Huang Y, Cao Y, Zou M, Luo X, Jiang Y, Xue Y, et al. A comparison of tissue versus swab culturing of infected diabetic foot wounds. Int J Endocrinol 2016;2016:8198714. 11. Bozkurt F, Gülsün S, Tekin R. Comparison of microbiological results of deep tissue biopsy and superficial swab in diabetic foot infections. J Microbiol Infect Dis 2011;1:122-7. 12. Aggarwal VK, Higuera C, Deirmengian G, Parvizi J, Austin MS. Swab cultures are not as effective as tissue cultures for diagnosis of periprosthetic joint infection. Clin Orthop Relat Res 2013;471:3196-203. 13. Tedeschi S, Negosanti L, Sgarzani R, Trapani F, Pignanelli S, Battilana M, et al. Superficial swab versus deep-tissue biopsy for the microbiological diagnosis of local infection in advanced-stage pressure ulcers of spinal-cord-injured patients: A prospective study. Clin Microbiol Infect 2017;23:943-7. 14. Dy Chua J, Abdul-Karim A, Mawhorter S, Procop GW, Tchou P, Niebauer M, et al. The role of swab and tissue culture in the diagnosis of implantable cardiac device infection. Pacing Clin Electrophysiol 2005;28:1276-81. 15. Sjöberg T, Mzezewa S, Jönsson K, Robertson V, Salemark L. Comparison of surface swab cultures and quantitative tissue biopsy cultures to predict sepsis in burn patients: A prospective study. J Burn Care Rehabil 2003;24:365-70. 16. Seekamp A, Kontop H, Schandelmaier P. Bacterial cultures and bacterial infection in open fractures. Eur J Trauma 2000;26:131-8. 17. Valenziano CP, Chattar-Cora D, O’Neill A, Hubli EH, Cudjoe EA. Efficacy of primary wound cultures in long bone open extremity fractures: Are they of any value? Arch Orthop Trauma Surg 2002;122:259-61. How to Cite This Article: Cherian J J, Lobo J O, Ramesh L J. A Comparative Study of Bacteriological Culture Results Using Swab and Tissue in Open Fractures: A Pilot Study. Journal of Orthopaedic Case Reports 2019 Jan-Feb; 9(1): 33-36.